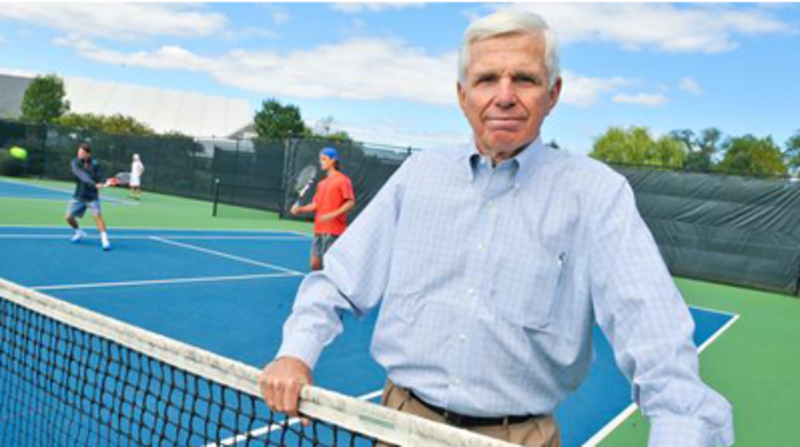 Mention the name Ray Benton to longtime residents of the tennis community, and they will know that not only is he CEO of the highly regarded Junior Tennis Champions Center (JTCC), but also how much he has done in a multitude of ways to shape the sport and raise its profile since the 1960's. Benton has always understood who he is and what he wants out of life. He is a man of many dimensions, gifted intellectually, determined to explore his professional limits, uncompromising in pursuit of his highest aims. He has spent a productive lifetime moving purposefully from one endeavor to another, chasing his largest dreams, realizing most of his foremost goals, and knowing how and when to rearrange his priorities. Above all else, Benton has been a distinguished citizen of tennis. Consider the scope of his impact. Growing up in Iowa, he started playing tennis at the age of 15. While he was in college, he became a tennis teacher. Serving in the United States Army, he was an instructor in public parks and country clubs, as well as varsity tennis coach at Jacksonville State University in Alabama. Thereafter, Benton worked for Dell, Craighill, Fentress and Benton in the late 1960's and was a founder at ProServ, the well known sports management and marketing firm. He was also the first National Executive Director of the National Junior Tennis League (NJTL), taking on that significant challenge forthrightly. He garnered a lofty reputation as a tournament director at over 100 events predominantly in the 1970's and 80's, including The Masters at New York's fabled Madison Square Garden. By the 1990's, Benton was poised for a new challenge. In 1993, he created the Nuveen Tour as his business partner Jimmy Connors spearheaded that senior circuit, while John McEnroe and Bjorn Borg regularly played those tournaments as well. That tour peaked at 22 tournaments, attracted 500,000 fans annually, and raised more than $35 million in corporate sponsorships. In recent years, Benton was a consultant to many entities in tennis, including the ATP. But when he landed at JTCC, Benton found an opportunity to explore his creativity, psychic fulfillment and practical know-how that perhaps suits him better than any role he has ever held. He had been on the board at JTCC, but in 2008 he took over as CEO. As Benton recollects, "As a board member, I had helped to bring Martin Blackman in to run the High Performance Program, and then I was kind of a business mentor to him. So we started talking about business practices, basic organization and fund raising. He then got an offer from the USTA [to be Senior Director of Talent Identification and Development]. Ken Brody [JTCC founder] asked me if I could consider becoming the CEO, and that was in September of 2008. Martin left for the USTA at the end of 2008, but I kind of took over as soon as he announced he was leaving. "Having worked with Martin and knowing Ken well, I knew quite a bit about the operations of JTCC, and I was a great admirer of the coaching staff and how they were able to turn out not only very good tennis players, but really nice and well-rounded young adults. I could see that they were stronger in tennis talent than business expertise. JTCC was losing quite a bit of money, so I was excited because it was a chance for me to get back fully in the tennis business after consulting with a number of organizations and [establishing] a company with Vic Braden." From the outset, according to many who know the tennis business and recognize Benton's strengths, it was a very good fit. Blackman—an estimable individual who took over from Patrick McEnroe as General Manager, Player Development for the USTA in June of 2015—speaks in the most laudatory of terms about Benton. When I reached him recently on the phone, he said, "It was about a year before I left for the USTA that we retained Ray as an independent consultant to take a look at our operations and do a general audit and see where [we] could improve our fundraising and our effectiveness. About half way through that year, Ray and I both had this idea about the concept of a regional training center so we jointly wrote a proposal to the USTA and specifically to Player Development. JTCC became the first USTA Regional Training Center." Elaborating on what he and Benton were looking to achieve by establishing JTCC in that capacity, Blackman says, "We have some great private sector coaches in the U.S., but we need to be really intentional about identifying the best programs with geographic diversity and subsidize those programs so that our best players stay close to home and develop for as long as possible. That was the thesis of the concept, and JTCC became the first. The program quickly grew and expanded to 21 regional training centers by the time I left my original position at the USTA." Asked to pinpoint the leadership qualities that guide Benton and enable him to make JTCC such a success story, Blackman replies, "Ray is a visionary. When he came in, he had a clear vision for what the program could be, which was to give it expanded and bigger reach and deeper impact. Ray is a very tough manager who demands the best from the people who work for him. He really challenges them, gives them immediate feedback, and doesn't accept mediocrity. When you have coaches and administrative staff working for you, you have a broad scope of operations: juniors from 10 and under all the way to elite programming, and some adult programs. You need a staff that has professional discipline and a culture that has a shared vision. And, of course, there is a lot of fundraising involved in his position, and he excels at that. All of these things make Ray very effective in his position." Elaborating on his thoughts about Benton and JTCC, Blackman asserts, “Ray deserves a tremendous amount of credit. Look at the culture. You can walk into JTCC, and you won't be able to tell the difference between the kids who are paying full boat and the kids on scholarships, or the kids who are ranked top 10 in the nation or the kids who are not even ranked in the top 100. The culture is that strong. That is a big compliment to Ray, who leads by example and embodies those values that permeate the entire program." Benton is asked about why JTCC seems right in his wheelhouse of capabilities, and if perhaps he has gone back to his roots in this post. He responds, "I think it is an ideal place for me. If you look at what I have done in the past, I am using a little bit of everything now. For example, I go to three or four tournaments a year. I will be out at the Easter Bowl, running between courts to see 10 to 15 different kids play, and I will be sitting by the side of the court thinking 'I am doing exactly the same thing I did 55 years ago' when I was loading up a station wagon on a Thursday night in Dubuque, Iowa with eight kids putting their bags on top, and we are going from Dubuque to Des Moines. I would be coaching them, watching them, being a father and mother superior for three days and getting nervous about their results." Benton continues, "We are doing a lot of community outreach with our coaches and staff going out and introducing tennis and looking for talent. That is exactly what I did in the early years at the National Junior Tennis League. I was going out to the inner city in Detroit and LA and Houston and it was very gratifying work. You get a lot of personal satisfaction working with kids. I always have." Having said that, Benton realizes that to serve in a wider range and make the most of his CEO responsibilities, he must keep his mind frequently centered on raising money. He explains, "I remember in the NJTL days I realized that having the ability to go to a sponsor and get $100,000 can help a lot more kids, even if you are giving up your personal satisfaction of working with the kids directly. I even came to the thought that to want to go out and enjoy myself with the kids on the courts was almost selfish, that I should be doing the bigger thing raising money. Frankly, I am going through the same thing here at JTCC, spending a lot of my time behind a closed door raising money and managing people. When I walk out on the courts at least once a day and say hello to the kids, it is kind of like a tennis fix. Would a part of me like to be teaching tennis three to four hours a day? Absolutely yes. But probably the single most important thing is having the ability to bring in the dollars, which is kind of a scare resource in our industry." Founded in 1999 by Brody, located in College Park, Maryland, JTCC has benefitted immeasurably from Benton's supreme fiscal dedication to the nonprofit organization and his deep devotion to the kids in terms of both their tennis and academic health. JTCC has introduced more than 3,000 kids to tennis across the years, as well as 4,000 children through their community outreach. Moreover, 1500 adults have been introduced to the game, receiving in some cases free lessons; and in other instances, inexpensive instruction has been offered to them. No fewer than 70 players played in top level national tournaments in 2016, and 90 kids have garnered top 100 rankings in their age groups. This would have been impossible without extensive fundraising. JTCC has offered $6 million in tennis scholarships over the past five years. They have had six players ranked in the world's top 10 ITF Rankings. They are Usue Arconada, Trice Capra, Mitchell Frank, Denis Kudla, Phillip Simmonds and the enormously promising Frances Tiafoe. There is more. Frank Salazar, then Senior Director of High Performance for JTCC, was chosen as the National Developmental Coach of the Year by the U.S. Olympic Committee in 2008. The much-heralded Vesa Ponkka, Senior Director of Tennis, earned that same distinction three years later. In 2013, Ponkka was awarded the National Developmental Coach of the Year label by Tennis Industry Magazine. JTCC was selected as the USTA Junior Development Program of the Year in 2013. Those who attend JTCC are required to take their academic life seriously and must fulfill their responsibilities; kids who do not meet the standard have been told to leave by Benton. In any event, Ponkka is the man with his finger on the pulse of daily tennis activities at JTCC and his guidance and expertise have been critical. Benton is delighted to have someone of Ponkka's unimpeachable credentials at the helm of the teaching operation and is buoyed by the results that have been attained on so many levels. "Our record is incredible for the number of kids who get to national tournaments," says Benton, "and the number of kids that get scholarships is extraordinary. I think we are the only major program in the country that is non-profit in terms of High Performance. I believe we are the only program in the country where you have to go out and give back by teaching in underserved neighborhoods. I have brought in a number of knowledgeable, fancy tennis people through the place, and they all comment on the positive culture. We are quite good at maintaining our integrity." He continues, "We have disinvited a number of kids who are top players—top 10 in the country— either because they did not keep up with their academics or they brought down practices with their attitude. I have to tell you: doing that has not been that hard at all. If we had just one top kid at JTCC and our identity was based on that player, it would probably be very tough to let that person go. But we had 47 kids go to the National Hard Courts this year. 47 kids playing in all of the events in different age groups! And we had one of our kids who was 12 at the time who won the Girls' 14s named Robin Montgomery and another kid who won the Boys' 14s, Saud Alhogbani. So if you have got 10 kids, and you line them up one through 10 in terms of prominence, to lose No. 3 or No.4 isn't so tough. To lose No. 1 when you have four top kids is probably pretty difficult." Benton expands on his point of view on how JTCC should be run. He asserts, "We have a philosophy that we are going to give equal attention to everybody. We have a true pathway where our senior coaches are very cognizant of what the eight and nine-year-olds are doing in developing the right strokes so they can move on to the 10 and 11-year-old program, and so forth. We have an adult pathway as well where you can take three free lessons, or you can take six lessons that are not costly, and if you like that you can take nine lessons at half price. We think through each step. Traditionally, the hot shot [teaching] pros are the really experienced ones so they work with the High Performance kids. Beginners might even be taught by an intern or a high school student in some places. But we believe at JTCC that perhaps the most important teacher on the court is the one who starts with a person. So the person who teaches the six-year-olds and the beginning adults has the same stature as the ones teaching High Performance." Ponkka jovially points to his history at JTCC and how it has all evolved. He says, "I started as a senior coach and then became a co-director and then became a director and then got fired. Then I became a senior coach and then a director. So I have been fluid. You name it. It has been a great 18 years. I am one of the founders from 1999, the last one left. I don't know if that is good or bad!" There is no doubt among those in the cognoscenti that JTCC has been fortunate to find such an admirable individual to be Senior Director of Tennis. Ponkka has worked closely with Benton through the years, and he contends, "There is no question that since Ray came in our fundraising has gone through the roof. He has got to be one of the best in the world at that. So that has given us resources to try to do our thing. We were strictly a High Performance program before, but now part of our mission is to grow the game and be a model for how that can be done. Before Ray we were doing great, but we were burning through Mr. Ken Brody's money. He paid for everything to build up the place. With Ray, we are running the non-profit like a business. Now there is a clear plan. It has been an excellent nine years for Ray." Ponkka—who has 12 full-time coaches working for him along with three fitness coaches and a mental training coach— considers himself fortunate to have the full backing of his colleagues and his bosses. He asserts, "Mr. Brody let me do my thing, and Ray has done the same thing so I have been able to put a great coaching team together. We have absolutely free hands to do our jobs as well as we possibly can. We keep pushing the envelope every day with our training and services. We don't measure ourselves against other places. We measure ourselves against each other by our own standards." And yet, JTCC and Benton are not immune to the complexities of modern day issues among the young, as Ponkka is well aware. He points out, "The big battle at the moment is to keep them focused. The attention spans are sometimes short. So we take their phones away in the morning and give them back when they are done playing because we really have to win that battle to keep the attention of the kids in school and in tennis. Nowadays you can have a group of kids who are all on the phones, and nobody talks to each other. I feel like outside society is moving in the direction of no patience, with everything needing to happen right away. But we know developing tennis players takes a long time. It takes 10 years at least to do it. Ray and I think a lot alike. We want to grow the game, and we want JTCC to be a great training center for kids from eight to 18. We want this place to really inspire people." That is precisely why Brody founded JTCC, and it is the reason he remains such an unwavering booster of the organization. When I spoke with Brody for this piece, he was unabashedly proud about what has transpired at the center. He said, "It is the best program in the country for training young Americans, and it is a complete joy. When it started, I wanted us to put something together that is terrific, a place where all the kids graduating from the program would either get Division 1 College scholarships, gain assistance getting into good Division 3 Schools, or an Ivy League school, or even in a few cases, turn pro. That is exactly what has happened. Ray has done a phenomenal job. He has enormous energy and is a terrific manager, fundraiser and leader. He is Triple A." That is a view shared by many in the inner circle, including one Sara Fornaciari. She is the President of Sports+Plus, and Marketing Consultant for JTCC. Fornaciari has known Benton since their days working together for ProServ in the 70's. Their level of mutual respect is considerable and far reaching, even if they "knock heads" from time to time. She says convincingly, "At his core, Ray has always been a promoter, but what he was promoting wasn't what fundamentally mattered or defined him. JTCC is what he truly believes in, which is trying to make an impact on young people's lives. When you are being an agent or promoting a tennis tournament, you are taking professional athletes who are pretty far advanced, and making more for them. That is great. When you promote a tennis event it is a great entertainment vehicle. But when you are making a difference in the lives of so many kids so they go to college on a D-1 scholarship, you are actually promoting the growth and development and the love of tennis. That is really at the core of what Ray has been about since the first days long ago when he was a teaching professional." Fornaciari pauses, collects her thoughts, and then adds, "Ray has achieved excellence in every aspect of the operations of JTCC because he will accept nothing less than that. So he has excellence in the coaching, excellence in academic preparation, excellence in everything he does. He can take pretty complicated operational challenges and make them seem seamless and smooth. So many kids need financial aid of some sort. Ray figures out how to make that work. And it is really amazing how well he does it. Ray is not a typical 76-year-old, not by any means. He seems more like 46." Brian Gottfried will attest to that. Gottfried is one of the game's most ardent loyalists, a former U.S. Davis Cup player who reached a career best at No. 3 in the world in 1977, and a client of Benton's going back to the seventies. Gottfried has been one of the country's finest coaches for the better part of 30 years, working for, among others, the USTA and the ATP. He also coached players on the tour including Jimmy Arias, Aaron Krickstein and Michael Chang. Benton hired Gottfried to work at JTCC's first satellite facility at the Bolles School in Jacksonville, Florida, and the popular Floridian is in his fourth year as Director of that facility. Moreover, Gottfried is a Senior Advisor for JTCC along with Mats Wilander and the revered fitness guru Pat Etcheberry. Benton recollects Alison Riske calling him a few years ago. Riske had done some training at JTCC, so she asked him if he could recommend someone who could coach her at the four majors, including the weeks leading up to those Grand Slam events. That would require a 12-week commitment in total. Benton told Riske, "I don't think I have got anybody for 12 weeks, but I bet Brian Gottfried would love to do, say, two of those tournaments.' " Riske was delighted by the notion of Gottfried in her corner, but when Benton asked him if he would like to take the offer from Riske, he told Ray, "Thanks, I really appreciate it, but I have got these kids I have got to coach at Bolles and..."
Recalls Benton, "He was so fired up about what he was doing with these kids to help them, so he did not coach Riske. It has been one of the happiest moments of my life watching him. There is no one I would rather be in business with." Gottfried holds Benton in no less regard. "Ray's business savvy has been incredibly helpful for Bolles, for me, and for our staff. We are growing each year, and we probably see 60 to 70 kids a week now. We started out with probably 15 to 20 in our first year. We want the kids to have fun and fall in love with tennis, but to learn it with good fundamentals, so if they make a decision to go on with the game they will have the proper tools. Ray just has this passion for people on the tennis court, and he has a way of relating to all of them." Benton has managed to take JTCC into new territory during his tenure, to make it better known, to provide leadership on many levels. His immediate goal now is to hire a Chief Operating Officer/ Chief Development Officer. "This person needs to know something about management, but also about being a tenacious fundraiser, to be a take charge, aggressive person, but also secure enough to put up with me for a few more years! We will find that person. The most important thing is the person must demonstrate entrepreneurial, revenue producing skills, and he or she definitely will need an appreciation of how tennis can impact the lives of both kids and adults." Benton had spent a significant amount of time talking about his work at JTCC, and others had put into sharp perspective what he has achieved, how he has done it, and why he is the right man for a job of such importance in the tennis community. But towards the end of our interview, I asked him to reflect on some of his other ventures that eventually led him to College Park and JTCC. He spoke of his long friendship and professional association with Donald Dell, and said, "I learned a lot from him and we complemented each other. Donald is a lawyer who has an instinct for marketing, and I am a businessman/marketer who happens to have a law degree. So that was good. Our negotiating approaches in some ways are similar and in some ways very different. We had the ability to argue with each other and disagree with each other, which I think is important. Donald and I had a wonderful 16 years working together before I left in 1986." Benton addressed his impressive stint as tournament director at The Masters in New York. "In terms of what I remember most," he reflects, “maybe it is ego driven, but the first Colgate Masters in January of 1978 stands out. This is a rags to riches story. Jimmy Connors and Guillermo Vilas played in the round robin. Vilas had just beaten Connors in the U.S. Open final four months earlier in a dramatic match. So their round robin Masters match was highly anticipated. Vilas won in three exciting sets. But he defaulted his last round robin match [against Eddie Dibbs] because Vilas was already in the semis. Bjorn Borg defaulted his last round robin match [to Brian Gottfried] but he also had qualified for the semis, and by defaulting he got to play Vilas in the semis, which was what he wanted. "So the newspapers went nuts about this travesty at Madison Square Garden and what a joke it was. Then Borg beat Vilas in his semi and Connors won the other semifinal [from Gottfried]. Connors beat Borg in a two-and-a-half hour final, 6-4 in the third. The television ratings were 10.5. The U.S. Open now gets a 3.5. So the lesson I learned was that it was about celebrity, and it is really important to be noticed. In other words, after a period of time people don't realize why they noticed you in the first place. So you could say there was a travesty at Madison Square Garden, but what people really remembered is there is a big deal event going on at Madison Square Garden, and it is big enough to be criticized. Right after that I had a four-man tournament called the Pepsi Grand Slam in Florida, and Borg and Connors played again in the final, with Bjorn winning this time in two hours and 45 minutes. That match got a 10.8 rating on television. So we went from a Seventh Avenue high with Vilas and Connors, a Friday low [with the defaults], and on to a Sunday high, followed by the Pepsi Grand Slam with an even better rating. Unbelievable." Asked what is his enduring memory of the senior tour he ran with Connors, Benton says, "It is always fun to start something, and people said there had never been a successful, profitable senior tour, which is like putting a red flag in front of a bull. The product was terrific, and so were the guys. Jimmy and Bjorn would cooperate with each other and do all the sponsor appearances because they had to. I remember saying to them that if we do our job properly, you guys will be prima donnas." We concluded this section of the interview by talking about Vic Braden, the masterful innovator/teacher/commentator/ sports psychologist who was inducted posthumously at the International Tennis Hall of Fame this past summer. Benton was asked by Braden's widow Melody to speak about Vic, which he did eloquently and honorably. Benton worked on different projects with Braden over the years and was his agent and manager in the 70's. He says of Braden, "I enjoyed Vic because he was intellectually honest and totally giving to a fault. He would stay up until 3 in the morning giving free advice and instruction on the internet, and then wouldn't realize he didn't have energy during the day to earn money. He had an absolute love of the sport and an absolute love of people. We bonded that way. In the 90's, he was an announcer for our senior tour. I was selling the tour in 1999, and he told me then how excited he was about brain typing and some wonderful research he was doing, but he wasn't making it commercially and asked if I could help him. So we started a company called VB Ventures. The company arranged for endorsements and appearances for him and licensed his videos, books and so forth. We did that for say six or seven years. We were soulmates." Benton touches on a few other vivid recollections of his early years in tennis, most notably Dr. Don Klotz, the creative coach at the University of Iowa who was Ray's "initial inspiration." In 1960, Klotz asked Benton if he would like to go to the Dubuque Country Club and start a tennis program there. Benton did just that. As he recollects, "They had two broken down courts there with 35 members playing. I had a general manager there who thought that tennis was at best a nuisance. I am not exaggerating when I tell you that he had two daughters who were both ranked No. 1 in the country in junior girls' golf, but I was able to overcome that, and the last year there I had 20 juniors ranked in the top five in the state in different age groups who had all started with me. That was very satisfying." Sound familiar? Is that the story of Ray Benton's life? The evidence strongly suggests that the answer to both questions is irrefutably yes. In conclusion, I asked Benton to assess his nine-year tenure at JTCC. Does he believe he has accomplished most of what he set out to do since 2008? Benton responds, "I think we are doing quite well. But I don't savor much. Maybe that is one of my weaknesses. I think it is a great strength to always look ahead at what can be done. Sometimes you get frustrated because you don't take time to say, 'Gee, that went well. That was good.' You move on quickly. But I will say this: I am told by other people that we are the best training center in the country, and I will be immodest enough to say I fully agree with that."